Porsche's 911 naming structure has gotten a bit out of hand lately, with things like 911 Targa 4 GTS becoming the norm, but they've stepped up that lengthy name convention with the new LEGO Big Brick 911 Turbo 3.0. LEGO recently introduced a scale model version of Porsche's iconic 3-liter 930, which comes alongside a brand new 911 RSR kit, as part of their Speed Champions line. Porsche decided to return the favor by building a full-scale version of that 1:20th scale version of their original design. It's a bit like writing a novelization of a feature film based on a comic book, it doesn't quite translate well, but it's an interesting project regardless. 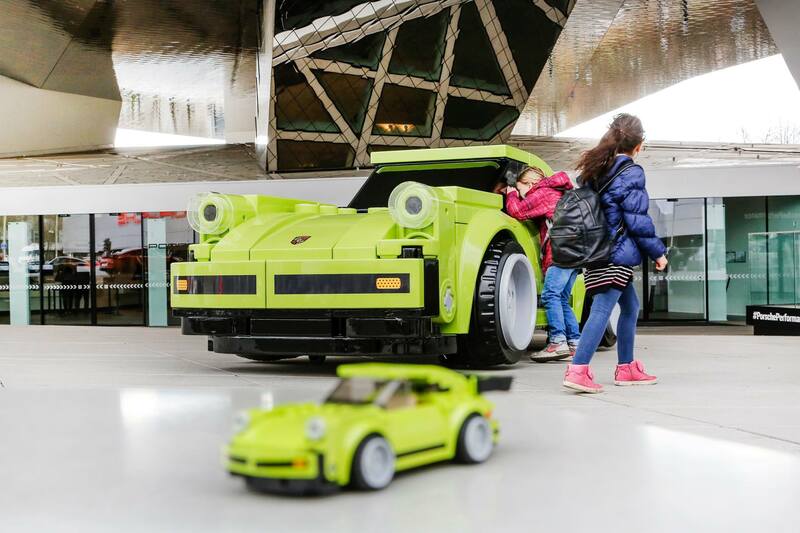 Porsche has really been touting their relationship with LEGO in recent years, creating half-LEGO, half-Porsche constructions that are interesting and vaguely humorous, as well as full-LEGO construction full-sized cars. This time, however, instead of using thousands of regular sized bricks to craft a life-sized facsimile, they scaled up the bricks to life-sized, and built the car that way. In scale model size it works, because the proportions will never be quite correct at that size with the limitations of LEGO being what they are. In life-size, however, it doesn't look quite right. It doesn't quite scale. Regardless, this bright green Porsche amalgam is an interesting and fun way to draw attention to the brand. It's currently on display at the Porsche museum in Stuttgart, and will stay there until April 19th, when it will be transported to the Porsche Tennis Grand Prix across town to be displayed for the duration of the tournament. Presumably it will return to the museum following that, and if we're lucky, Porsche will ship it over to Rennsport Reunion at WeatherTech Raceway Laguna Seca later this autumn. For now, though, the only way to see this odd piece of Porsche history is to travel to Germany.